Your Boarding Station for adventure in Sedalia! 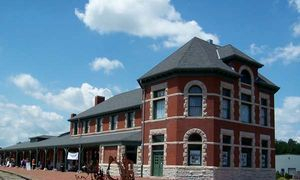 Sedalia's historic Katy Depot at 600 East Third Street, with its elegant Romanesque Revival Style appointments, is just a sample of the bill-of-fare awaiting you as you blaze your way down the trail. Your stationmasters at the Sedalia Heritage Foundation are excited to invite you to relax here awhile, refresh yourself and enjoy true Missouri hospitality. The Missouri -Kansas-Texas Railroad began operating in Sedalia in 1873. Architect Bradford Lee Gilbert designed the Depot which George Goodlander built of limestone from the nearby Georgetown Quarry. It was officially opened on May 10 1896. The popular gathering spot served the community with elegance and charm for more than 60 years until the last passenger train left the Depot in 1958. The Katy Depot was offered for sale in 1983. The Missouri Division of State Parks took title to the building in 1987 as part of the Katy Trail State Park. If you follow the path of the old MKT, you'll see the tracks have been removed and the route converted to a walking and biking trail. From 1998 to 2001 the Depot underwent extensive renovation that restored this grand old building to its original grandeur. The Depot is proudly listed on the National Register of Historic Places. It is also now the home to Sedalia's Welcome Center and proudly features Heritage Exhibits, which opened in 2003. The unique design of the exhibits represents the way railroads influenced the community. Graphic panels, exhibit cases and an audio-visual presentation room were added in 2004. As you enter the Depot the gift shop greets visitors with Sedalia souvenirs, Missouri-made products, train fan items, and Katy trail souvenirs. The grounds around the Depot are home to one piece of rolling stock--MOPAC caboose #12099, and several art sculptures that symbolize Sedalia's heritage. The "Rag Tag Train" is a whimsical metal train sculpture by Springfield, Missouri artist Christine Shilling. Sedalia artist John Guffin created both the "Step Up Caboose" and the "Syncopated Rhythm Piano" sculptures. The caboose represents Sedalia's railroad heritage with one side designed for the Katy Railroad and the other for the Missouri Pacific Railroad. The piano celebrates the ragtime heritage of Sedalia. Experience the history and beauty of the Depot for yourself!